After long, but fulfilling day on Saturday, I slept in on Sunday, waking to the sound of pouring rain outside my window. Our brief respite from the winter weather was over and it was back to business as usual for January in San Francisco. I decided to leave later than I had originally planned, which was a good decision, since when I arrived around 2:15p, I was still the first person in line at Cobb’s. Situating my umbrella to protect me from the drizzle, I popped my headphones on and listened to the Nerdist podcast with Ben Folds while I waited. I was cold, wet and more than a little hungry, but I knew that getting my choice of any seat in the house for this show was going to be more than worth it. It was only about three years ago that I first discovered the Upright Citizens Brigade, thanks to a friend of mine to who took me to Manhattan to see ASSSSCAT3000 for my birthday. We waited in line for the free 9:30 show and Chevy Chase was the guest monologist. 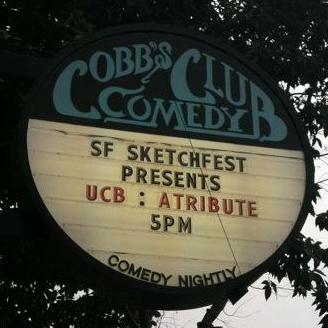 I fell in love with UCB, long-form improv and ASSSSCAT. And when I found out that this fantastic company had come from Amy Poehler and her co-hort? Even better! Last year, I went to ASSSSCAT at SF Sketchfest, where the guest monologist was Joshua Malina. I tried to get tickets to this year’s ASSSSCAT, since Amy Poehler would be participating, but they sold out in about 3 minutes. I snatched up tickets to the tribute show instead and was delighted when it was announced that Andy Ritcher would be the host of the event. Though the tickets said doors would open at 3:45, it was after 4p before I got inside to start to warm up. And unfortunately, because I was by myself, I was grouped together with two teenage girls and shuffled to the back of a table with them. The couple who had been in line behind me got the front row and those who had been way behind them ended up at my NPH table. I know that waiting tables at a club like this has got to be a nightmare, but there has GOT to be a better system for people attending shows alone, so we aren’t group in a bill with people we don’t know, whispering in the dark about how to split the check. Anyway, the creators of SF Sketchfest kicked off the evening by explaining that UCB took a chance on Sketchfest when it was in its second year, lending it some clout and credibility. They have returned in some form every year since. This tribute was to thank and honor the group for their loyalty and awesomeness. Then Matt Besser, Amy Poehler, Ian Roberts, Matt Walsh and Andy Ritcher took the stage. Andy took us through each of the members moving to Chicago and how they met, their decision to move to New York and getting the TV show and buying the theatre. Matt Besser had most of the historical knowledge, but everyone had stories and quips about their past. Like I said on Twitter, Amy Poehler has the BEST laugh and I got to listen to her laugh for almost two hours. It was amazing. There was also time for questions from the audience and it only got weird a couple of times. One guy asked a question and then handed out a copy of his senior thesis for Amy to watch. She did actually take it, looking over the packaging, while the guy pointed out that he’d actually met her twice before in New York. She, of course, had no recollection of this, but stayed cordial about it. One of the last questions was from one of the teenagers I was seated with, looking for permission to skip college to go into improv. Amy was especially concerned that she wouldn’t go to college, trying to convince her to hit up a community college in LA, where she could take class at UCB and IO West on the side. It was all very adorable and you could see Amy the Mom coming out during her answer. The girl was just excited that she got to spend five minutes talking to Amy Poehler. All too soon, the event was over and we were shuffling back out in the rain, stopping at the sports bar on the corner to check the 49ers game score (still tied at 17 at that point). It wasn’t a laugh a minute like the shows on Saturday, but I was so happy that I had attended, paying tribute to a legend in improv.